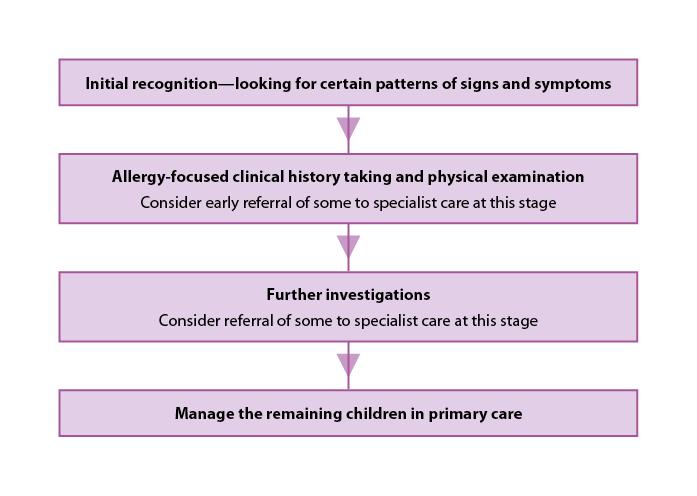 how to manage the remaining children with cow's milk allergy in primary care. A UK birth cohort study has shown that up to 3% of 1–3-year-olds can be confirmed as having cow's milk allergy (CMA), making it the most common food allergy in the early years of life;5 milk allergy most commonly presents in the early weeks or months of life.2 In a study (published in 2010) of 1000 infants with a diagnosis of milk allergy, randomly chosen from a UK healthcare database, 86% were first diagnosed in primary care and most were then managed in primary care.6 This study highlighted evidence of under-recognition, incorrect diagnosis, significant delay in diagnosis, and subsequent suboptimal management of the infants, especially in choosing the most appropriate initial hypoallergenic formula to prescribe. As a response, NICE published the 2011 Clinical Guideline 116 (CG116) on the Diagnosis and assessment of food allergy in children and young people in primary care and community settings.3 The NICE Clinical Knowledge Summary (CKS) on Cow's milk protein allergy in children2 (aged 5 years and younger) was subsequently published in 2014, drawing largely on NICE CG116 with regard to the initial diagnosis and assessment of any food allergy in primary care and indications for referral; the CKS also references other guidelines, particularly the UK MAP Milk Allergy Guideline published in 20134,7 to address the ongoing care of those children with milk allergy who should be managed in primary care. Manage those remaining children with suspected CMA in primary care. Discussion around these four goals forms the basis of the remaining article, which summarises the key evidence-based recommendations relevant to primary care. realise that any family history of atopic disease (e.g. eczema, allergic rhinitis, asthma, or food allergy) in parents or siblings makes either IgEmediated or non-IgE-mediated food allergy more likely to be confirmed— although there will still be children presenting with CMA who will not have a family history of atopic disease. Acute flaring of atopic eczema. Faltering growth plus one or more of the above gastrointestinal presentations (with or without significant atopic eczema). More serious signs—Anaphylaxis e.g. stridor, cough, wheezing, shortness of breath, with or without listlessness, pallor. Lower respiratory—e.g. cough, wheezing, or shortness of breath. When a pattern of signs and symptoms is recognised that could be due to CMA (and this suspicion may or may not be further strengthened by a positive family history of atopy), then an allergy-focused clinical history is the cornerstone of progressing the diagnosis. 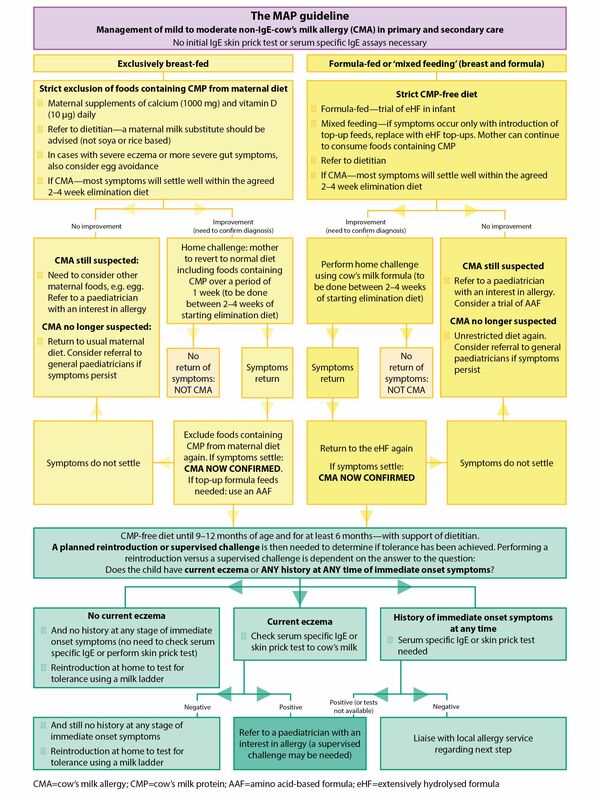 The required questions that the first-contact clinician should ask, shown in Box 2, below, have been adapted from NICE CG116 to specifically relate to an infant with suspected CMA. details of any other previous management, including medication, for the presenting signs or symptoms and any apparent response to this. look for persisting signs such as faltering growth and malnutrition, and signs indicating allergy related comorbidities (e.g. atopic eczema). Offer skin-prick tests or blood tests for IgE antibodies specific to cow's milk protein (CMP) and, if indicated, also to likely co-existing allergenic proteins (e.g. soya). Try eliminating all sources of CMP for a 2- to 6-week trial from the infant's diet or mother's diet if the infant is exclusively breast fed. Then reintroduce CMP at home to either confirm or exclude diagnosis of milk allergy. Weaned infants—start infant on an overall CMP-free diet, including an appropriate hypoallergenic formula. Formula fed, mixed fed, and weaned—seek early ongoing dietitian support on confirmation of diagnosis. eHFs—extensively hydrolysed formulas: these formulas are tolerated by 90% of infants and children with milk allergy.2 While they are based on cow's milk protein (CMP; casein or whey fractions), they are extensively broken down into smaller peptides that are less well recognised by the immune system. significant atopic eczema with suspected food allergy. one or more acute systemic reactions. CKS=clinical knowledge summary; CMA=cow's milk allergy; eHF=extensively hydrolysed formula; AAF=amino acid-based formula Adapted from NICE CG116 and CKS. † Specialist refers to a paediatrician with the skills, experience, and competencies necessary to deal with the particular concern that has been identified by the referring healthcare professional. In practice this may be a general paediatrician, a general paediatrician with an interest in allergy, or possibly a consultant paediatric allergist. NICE CG116 only addressed the initial assessment and recognition of food allergy in children in primary care and community settings. Its commissioned scope did not include the ongoing management of any child with confirmed food allergy. On confirmation of CMA, a CMP-free diet should be continued with later testing for naturally acquired tolerance. 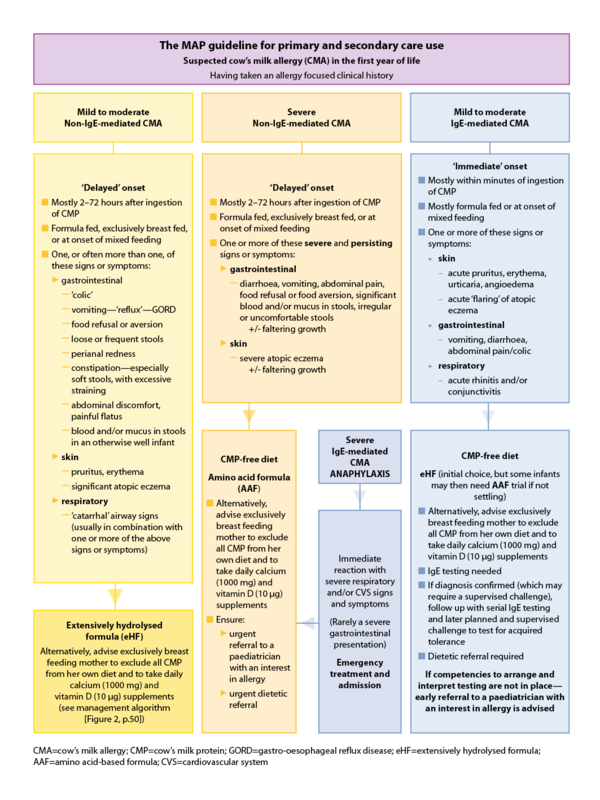 The first MAP algorithm (see Figure 1, below)4 outlines all the possible clinical presentations and the need for an allergy-focused clinical history, and advises on the first-choice category of hypoallergenic formula for each of the presentations. It also highlights when specialist referral should be considered. The management of mild to moderate non-IgE-mediated CMA is the focus of the second MAP algorithm (see Figure 2, below). Following an initial trial of a strict CMP-free diet, the infant's signs and symptoms will usually settle comfortably within 2 to 4 weeks if they are due to mild to moderate non-IgE CMA. A planned home challenge should then be carried out to confirm the diagnosis. The MAP protocol for this challenge can be accessed at www.ctajournal.com/content/3/1/23 (see Additional File 1, Part 1). Once CMA is confirmed, strict avoidance of all CMP with dietetic support should be continued until at least 9–12 months of age and for at least 6 months in all. A test for tolerance can then be carried out, using a milk ladder—such as the MAP milk ladder4— for home reintroduction (see Figure 2, below). The ladder and additional resources can be accessed at: www.ctajournal.com/content/3/1/23 (see Additional File 1, Part 2). Cow's milk allergy is the commonest and clinically most complex form of food allergy among children in the UK.4 The first signs or symptoms typically appear in the early weeks of life and usually present in primary care.2,6 There is evidence of apparent missed diagnosis, incorrect diagnosis, delayed diagnosis, and subsequent suboptimal management in a significant number of these infants.6 The challenge is that resulting from this, we now have three UK guidelines that are related to the early recognition, diagnosis, and management of milk allergy in primary care with the very real potential for 'guideline overload'. This article has drawn together the recommendations for primary care from these three guidelines. The MAP milk allergy algorithms on p.48 and p.50, designed by a subgroup of the clinicians on the NICE CG116 food allergy guideline development group, have been piloted in the Northern Ireland region of the NHS and demonstrated a significant positive impact on patient outcomes and prescribing, with potential cost savings.